US/Silver Spring: Apotex Corp., a Toronto, Ontario establishment, recalls certain batch/lots of Fluticasone Propionate Nasal Spray, USP, due to suspected glass fragment contamination and consequential risk of spray blockage, oral and/or nasal injury, and respiratory tract laceration damage, all serious health and safety hazards. 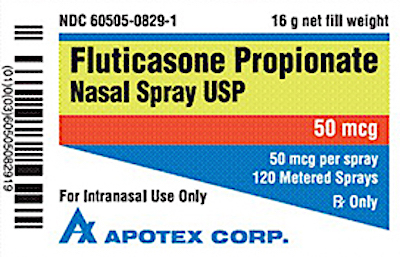 According to the FDA, the Fluticasone Propionate Nasal Spray USP 50 mcg per spray 120 Metered Sprays has been found to contain small glass particles. The glass particles could block the actuator and impact the functionality of the pump. The issue was discovered through a customer complaint. In general, if bone, glass, metal, plastic and/or rubber fragments are ingested or inhaled, they could cut the mouth, nose, stomach or other parts of the GI tract, cause intestinal perforation or serious infection and possibly require surgical intervention for their safe removal. ==> Never depend on your senses of sight, smell, taste or touch to confirm drug poisoning, adulteration or contamination. If in doubt about the safety of any drug, return it to your ph for refund or toss it out in your household garbage, making sure neither small children nor household pets can access the suspect food. If you believe you have purchased or have in your possession any of the recalled Fluticasone Propionate Nasal Spray, please do not consume them directly nor use them as an ingredient in another dish or preparation. Instead, return the Fluticasone Propionate Nasal Spray to the pharmacy or other distributor where you purchased it for a full refund. ==> To see other recalls and notifications caused by contaminated, adulterated or mislabeled Drugs, please search for “Drugs” using the Search Box at the top of this page. ==> To see other recalls and notifications for products manufactured, marketed and/or sold by Apotex Corp., please search for “Apotex” using the Search Box at the top of this page.